Boss RC3 review by Vein-Tap.com | Boss made the first digital sampler in compact pedal form in 1985, almost thirty years ago. That pedal – the DSD-2 – could record for less than a second, making it practically useless for anything except recording drone sounds. Fortunately, the Boss RC-3 Looper is much better, with up to 3 hours’ worth of recording time, stereo inputs and outputs, rhythm click tracks, and 99 memory banks. The Boss RC-3 Looper, the compact pedal entry to Boss’ Loop Station range, is so tiny it’s hard to figure out where it keeps three hours of your awesome sounds. Compared to its much bigger brothers, the RC-30 and the RC-300, this looper is limited on features, but its portability at least makes up for that fact. The RC-3 Loop Station easily holds its own, both in features and price, compared to its bigger siblings. Can You Use It Live? Boss has helped you out here by including auto-quantise technology, which is able to make tiny corrections for the left-footed amongst us who have trouble keeping perfect foot-to-eye co-ordination. This is actually very helpful, and not as intrusive as it sounds: for the most part it is genuinely helpful. But is it good enough to use as a phrase looper whilst you’re playing live? The Boss RC3 won’t sub for a second guitarist: nothing will. However, for solo musicians, this pedal really can be a godsend, especially for postrock or “arty” players: the potential to create soundscapes well beyond the scope of a single musician really is limitless. We know that the cellist Zoe Keating uses phrase looping during her performances, and we wouldn’t be at all surprised to see an RC series looper beneath her toes. There are limitations, however, some of which we’ll get to later, but one unforgivable flaw which we can’t let lie is the couple of microseconds’ pause in between loops when switching memory banks. This flaw, which has yet to be fixed by firmware update, means that guitarists playing in bands will find it difficult to change pre-recorded phrases whilst soloing – this might not be a problem for some, but is a real impediment for me. However, it’s not all bad. A couple of options help the RC-3 suit itself to your preferences; Auto-Start functionality can make it so the pedal only starts looping when you start playing, rather than hit the pedal. If you’re playing reggae or especially off-beat chops, this could be a little problematic, or if your line is especially noisy this could also be a problem. Best to experiment. The RC3 also offers auto-rerecord or plain playback looping, meaning that you can choose between layering another pass as soon as you’ve finished recording the first take, or just playing the recording back. You’ll find yourself changing this setting relatively often, depending on the song you’re playing (at least, I do) so it is nice to have the option. All told, most of the RC-3’s live capabilities rest on your drummer’s shoulders; if he or she can keep constant, unfailing time, you’ll find your RC3 to be a great companion. It’s not so easy you won’t need to put hours and hours of practice in though: I recommend introducing it in the practice space to see whether your live act will work with a looper. Are There Any Other Practical Uses? The RC-3 comes into its own, and is in my opinion even better, when used as a practice tool. You can create unique changes and really get outside of your own head by looping a basic idea and then throwing some uncharacteristic chords at it. If your moaning vocalist or other band members have ever told you that your new riff sounds the same as another song you wrote for them – using an RC3 for generating ideas will wipe the smugness of their faces. You’ve also got a fantastic tool for looping sections you particularly need to practice – tricky runs you’ve written but not perfected, perhaps. With the aux in jack and the ability to slow loops down without changing pitch, you’ve got a formidable practice tool in the RC-3. For us, it’s what the RC3 was invented for. Is it Easy to Use? or Fiddly? The RC3 is surprisingly user friendly. Due to the previously mentioned auto-rerecord, quantise and start options, the pedal can quickly and comfortably be figured out. And – to put it bluntly – there isn’t really much to figure out about click to start, click to stop recording! That’s not to say that the RC3 has restrictively limited features. With its USB out, aux in and 99 memory banks (including 10 backing tracks loaded onto patches 90-99) this pedal could be all the loop station you ever need. The Best RC Series Looper? Comparing the RC series loopers is a bit of a false economy – no one RC looper is “better” than any of the others. You can basically add a stereo track for every 0 on the end of the looper’s number – the RC-3 has one stereo track, the RC-30 has two, and the RC-300 has three. The bigger loopers have got more features than the RC-3, of course: both the RC-30 and RC-300 have effects you can add to each loop, but we can’t think of a practical use for them. The two bigger stations do, however, have rather enviable XLR inputs, and the 300 has an expression pedal which we could definitely put to good use – but these loopers are far more expensive and much larger. The reason we love the RC-3 is because it’s beautifully small. 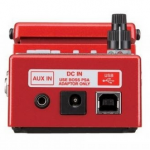 A respectable looper the same size as a DS-1 distortion pedal – you can’t argue with that! However, its size does count against it in one way: there’s too much fiddling with the control panels, as the single foot pedal the RC-3 has isn’t enough to control everything you need to. 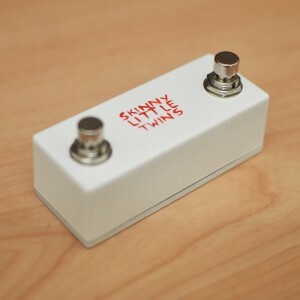 We’ll save the sales pitch (we’ve already written one) but what we will say is this: everyone we’ve ever sold a Skinny Little Twins dual momentary footswitch to for use with an RC-3 has said the same thing – they can’t remember how they ever managed without one. You very seriously need to get yourself hold of a Boss RC-3, unless you feel the need to upgrade to one of its bigger brothers for whatever reason. Sell your other pedals, dog or mother in law to be able to afford one. Then you need a Skinny Little Twins.